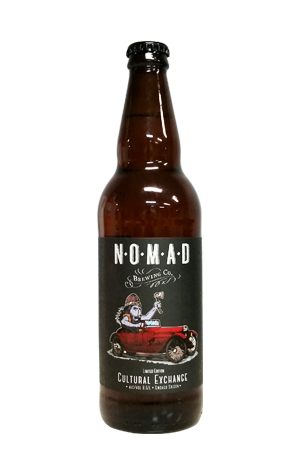 When you've successfully snapped up several of the world's best brewers to your distribution business and you own a brewery, it makes sense to combine the two – and it's something Nomad has been doing with relish. Cultural Exchange (so called because it features a yeast strain from Jester King's Texan farmhouse brewery) started out in May 2015, when Ron and Amber from Jester King were in Australia for Good Beer Week and GABS. The two breweries decided upon a smoked saison, using spices as well as the indigenous Texan yeast strain. After eight months spent in Chardonnay and Shiraz barrels before blending and packaging, it's fair to say that if you've got a thirst that needs slaking fast, this is not the beer for you. On the other hand, if you feel like approaching a beer like a final year student does their dissertation, dive in. It's complex as hell; no doubt a room full of different people could pull it apart and come up with a dissertation's worth of descriptors. Here we were met with smoke first – both woody and sweetly aromatic – while there's also seaweed (like you'd find in some Islay whiskies), malt sweetness, lifted saison characteristics, lemon, a saltiness, spice, band aid, something herbal and a lot of oak. Like we said: complex.